Cafes and bars in Beijing’s university district have reportedly been ordered to cater to no more than 10 foreigners at a time. Staff members say the orders were given last week, shortly after China’s annual legislative meeting began in Beijing. It’s unknown what prompted the orders, but the rise of anti-Xi Jinping sentiment among students internationally could be part of the reason. 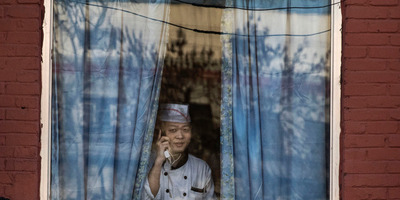 Restaurants in one Beijing neighbourhood have been ordered to limit the number of foreigners they serve. Cafes and pizza bars in Wudaokou, Beijing, were reportedly ordered this week to serve no more than 10 foreigners at a time. Three bars and restaurants confirmed they had received the orders to South China Morning Post. Business Insider first saw notices posted online over the weekend announcing that the restrictions would last until two days after the end of the National People’s Congress (NPC) – China’s annual legislative meeting. Workers at two restaurants told The Post that police had made requests to limit the number of customers, particularly those of foreigners. An employee at another pizza bar said they couldn’t let foreigners into their premises after 8 p.m. According to the staff, the orders were given last week, shortly after the NPC got underway. This year, Beijing police also began testing facial-recognition glasses ahead of the NPC. It’s unknown why establishments in Wudaokou may have been targeted. But its role as Beijing’s university district, due to it housing both Tsinghua and Peking University, may have something to do with it. Around the world, students have been protesting the NPC’s decision to scrap presidential term limits by hanging posters declaring President Xi Jinping is “Not My President” in universities across the US, UK, New Zealand, and Australia. Combined with over-the-top local censorship and widespread international coverage of Xi’s ability to rule China indefinitely, Beijing could be concerned about too much interaction between foreigners and local students.